Joplin, Missouri Tornado: What’s Causing the Rise in Deadly Storms? Interior Greenland is experiencing surface temperatures of -36C while it’s +30C in parts of France. The surface and upper level low pressures features pushing towards Scotland are close together. By stacking the upper low on top of the surface low and ride a very strong jet stream over top and you can get very powerful upper level winds dropped down to the surface. That is the concern this afternoon and into the evening across much of Scotland as the pressures continue dropping as the storm crosses the country. Winds are likely to push 60, 70, even 80mph throughout the country. I believe there may be ‘unexpected’ enhancement of the surface winds across Scotland between 4-9pm tonight because of the heating up over France late this afternoon towards 30C in Paris which can enhance upward motion and the pulling in of warm, moist air into the low from the south. The fact that we’re seeing such intense cold in the upper levels feed into the NWE side of this low from Greenland means unusual deepening within this depression. This intensity of low moving into Scotland is more like what you would see in October. Another problem will be that most trees now have their leaves at this time thanks to both the late stage in spring as well as an abnormally warm April. 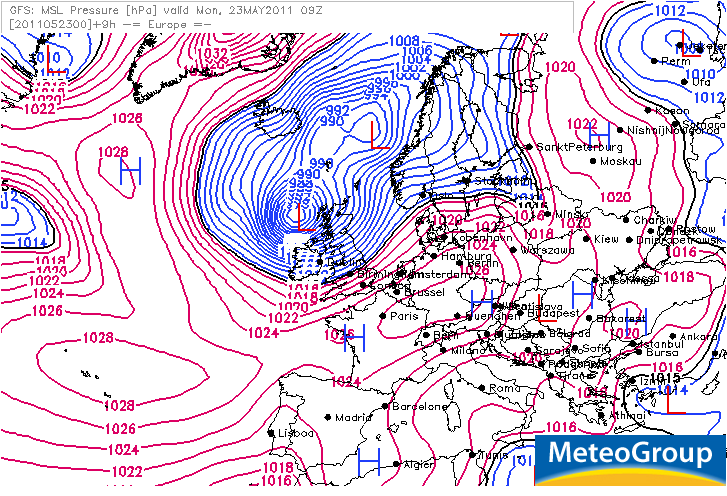 This combined with powerful winds will make it easily for trees to blown down, blocking roads and railway lines. This trees that are very exposed up at the Crow Rd Car Park in the Campsie Fells were getting whipped pretty good by the strong winds this afternoon. As you can see from the above satellite view, the core of low pressure is drifting off the north coast of Scotland but as this image was captured, sustained winds are blowing at 30 to 40mph across the country with most areas witnessing gusts beyond 60, if not 70mph. This evening we are seeing heavy rains pile in aboard still strong, gusty winds but these winds will begin to ease as the night wears on. 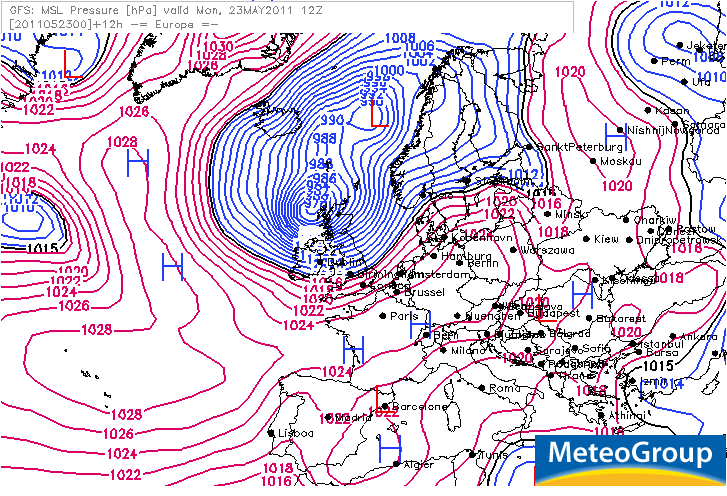 The powerhouse low will eventually push up into Scandinavia bringing heavy rain and wind to there. As for the coming days, the winds may remain blustery through tomorrow (Tuesday) over Scotland with a feeding in of cool air out of the northwest on the storm’s backside. Unfortunately, winds aren’t really going to get a chance to die off completely before the next Atlantic low arrives by Wednesday. This new feature is currently out over the North Atlantic and once here, by Wednesday, it will present Scotland with heavy, winddriven rains. Winds shouldn’t be as strong, but they will be blowing pretty good nonetheless. As for the rest of Europe. Well for the rest of today, you can see from the above satallite image that thunderstorms are blossoming across western and central Spain, southeast France and over the Balkans. Another large band of cloud can be seen clearly just to the east of Greece and this bend up over western Russia and into southern Finland, bringing rain to this region. The heat continues to be on across pretty much ALL of the European mainland while a chilly air mass transported in via the current storm system over Scotland keeps us locked out from the rest of the continent. The typically sunnier and warmer southeast of England remains relatively unsettled and cooler. Unfortunately for increasingly arid France, the cold front that is associated with our storm system today won’t reach into France and bring them the much needed soaking, the front will miss France, leaving them dissapointing once again. Another Big Tornado and Severe Weather Outbreak on Tuesday! The US continues to suffer a pattern all too conducive for severe weather development and today will be no different. We will see severe weather possible anywhere from the Southern Plains up into the upper Ohio Valley, including the cities of Indianapolis and Detroit. The secondary area of potential severe weather with tornadoes possible will be stretched from the north suburbs of Philadelphia southbound along I-95 to Richmond, Va later today. A line of strong thunderstorms has formed in a north-seouth line across central Pennsylvania and this will move east towards Philadelphia and perhaps even New York City later tonight, the secondary line that’s over the Shennandoah Valley will also progress eastwards towards Richmond, Washington and Baltimore. 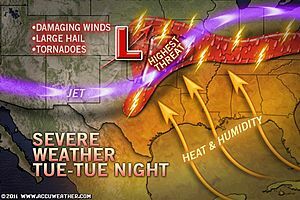 As for tomorrow, well it appears that given several key ingredients coming together once again, like we’ve seen all to often this spring, most recently yesterday, it appears that tomorrow (Tuesday) will be another big day for severe weather potential across an all too familiar region, the Southern Plains into Missouri and Arkansas. 1) A surface low pressure will dive into the Oklahoma/Texas Panhandle tomorrow, this will pull warmth and very high dew point air north from the Gulf. 2) A very strong jet stream blowing over top of this surface low creates a lot of steer with a west upper wind from the jet, a NW wind from the low and a S, SE surface wind all combines for the adiquate turning for thunderstorms that form to become violently rotating supercell thunderstorms that could and likely will produce tornadoes. I shall have more on this unfolding situation tomorrow, Stay Tuned. Cross Equatorial Flow has picked up considerably in the Arabian Sea. Winds over 30-35 knts are seen gushing Northwards off the Somali Coast. Today’s SST map is reproduced here to show the Sea temperature falling along the Somali coast. It is presently around 26c. Now, this difference with the Central Arabian Sea plays a key role in cloud formations in the Central Arabian Seas. 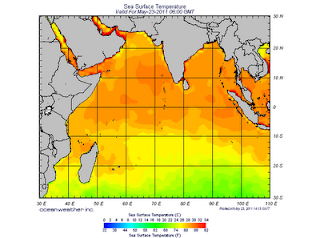 The SST along the Somali coast will rapidly fall to around 18/20c in the next 15 days. But the current fall is sufficient to help form Monsoon clouds off the Maldives. Cloud formation near Maldives is gathering, and in next 24 hrs, wind speed along the Maldives coast is estimated at 40 mph as per the country’s Met Dept. The ITCZ has moved up a bit and is now around the 3N region south of India, and in the %N region in the Bay sector. SWM should set in over the Maldives within next 36 hrs, that is by the 25th/26th May. Further advance into the Sri Lanka coast is possible around 26th/27th. The Seasonal Low seems to have got punctured. 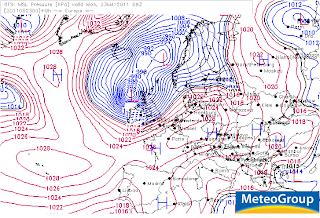 With the M3 creating an undesirable situation, we see today’s pressure at 1000 mb. Not enough to create a gradient to pull up SW winds into the mainland. The day temperatures on the SubContinent Northern plains have dropped since Saturday, and restricted the day’s highs to around 40c. Across in Pakistan’ Sindh region, the core for the formation of the low, the highest was 47c on Monday. M3 HAS become the “kill joy” we had NOT hoped for ! M4 is seen on the horizon, and will be into Pak/India Northern regions from 26th May. Rainfall increasing into Nepal from 27th May. The Bay sector has been unusually weak. Its lack of systems could be attributed to M3. Strong westerly currents prevent the formation of lows to move into the bay and towards the Indian mainland. They divert the forming currents. As SW winds should pick up speed in the next 2 days, SWM “in situ”, could advance into the bay Islands as a weak current on the 26th of May. Better before the M4 reaches the region to spoil another “party”. Conclusion: SWM advancing into Maldives by 25th (late by 5 days) and Sri Lanka by the 26th of May (late by 2 days). Similarly, SWM moving into Bay Islands by the 26th of May. (Late by 5 days). Advance into Kerala around expected date , 3rd/4th June. But, further advance needs monitoring. Formation of a system in the Arabian Sea possible in the first week of June. I greatly encourage you to click here to view our partner’s blog now and see the very best personalised weather information for India and the sub-continent.